The new wall-hung WC has a square design which combines perfectly with the square washbasins. 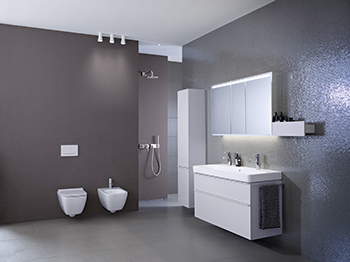 Geberit has radically revamped the Smyle bathroom series, which now has an even more delicate and modern look. The design of the washbasins and furniture is coordinated in such a way that individual combinations are possible. “The most striking change is the new design of the furniture, which was adapted to the form of the ceramic sanitary appliances as part of the facelift,” says Gabriel Nassar from Geberit. Unique bathroom designs can be created using open or closed medium and low cabinets designs. The handles now mirror the contour of the washbasins in terms of their ornate lines and continue their design language. This manifests itself in the rounded edges on the simple yet modernly designed profile handles, which have the same colour as the furniture. 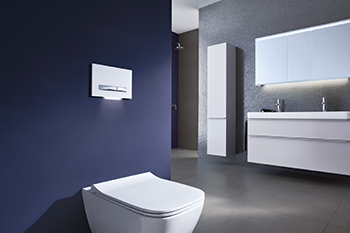 The ceramic sanitary appliances from the Geberit Smyle bathroom series have a lightweight appearance. Ornate lines, harmonious shapes and narrow rims on the washbasins contrast with the functional inner basins and the generous shelf surfaces at the rear of the washbasin. Plumbers can mix and match the furniture according to the customer’s wishes. For example, the medium cabinets can be combined in different ways depending on the customer’s requirements. Thanks to the option of open or closed storage space, these cabinets offer a great deal of creative freedom in line with the customer’s personal preference and bathroom size, says Nassar. 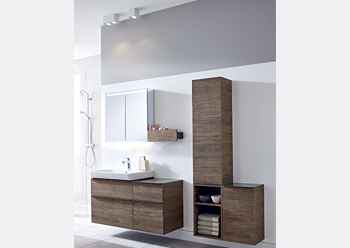 Using the open or closed medium cabinets and low cabinets results in individual bathroom designs. The medium cabinet also impresses thanks to its glass shelves and the mirror on the inside of the door. The classy glass tops – which also protect the furniture against scratches – are the same colour as the furniture, or lava in the case of wood finishes. Smyle bathroom series ... revamped. The new wall-hung water closet (WC) is the epitome of modern bathroom design. Thanks to its square design language, it combines perfectly with the square washbasins, while its shrouded outer shape makes it even easier to clean, he says. Geberit offers the WC seats in a slim design, either in a sandwich shape or as an overlapping seat. To ensure exceptional hygiene, the seats can be easily removed for cleaning via the QuickRelease hinges. The bathroom series will be available from April this year. Headquartered in Rapperswil-Jona, Switzerland, the globally operating Geberit Group is a European leader in the field of sanitary products. Its production network encompasses 29 facilities, of which six are located overseas. With around 12,000 employees in around 50 countries, Geberit generated sales of CHF 3.1 billion ($3.12 billion) in 2018.